Alerts you when the system detects a possibility of your vehicle unintentionally crossing over left or right side lane markings. If your vehicle is getting too close to detected left or right side lane markings without a turn signal activated, LDW will give audible and visual alerts. The beeper sounds and the LDW indicator blinks, letting you know that you need to take appropriate action. The beeper sounds and the Lane Departure message appears on the multi-information display, letting you know that you need to take appropriate action. Like all assistance systems, LDW has limitations. Over-reliance on LDW may result in a collision. It is always your responsibility to keep the vehicle within your driving lane. LDW only alerts you when lane drift is detected without a turn signal in use. LDW may not detect all lane markings or lane departures; accuracy will vary based on weather, speed and lane marker condition. It is always your responsibility to safely operate the vehicle and avoid collisions. • The vehicle is traveling between at 40-90 mph (64-145 km/h). • The vehicle is on a straight or slightly curved road. • The turn signals are off. • The brake pedal is not pressed. LDW may automatically shut off and the LDW indicator comes and stays on. The camera is located behind the rearview mirror. 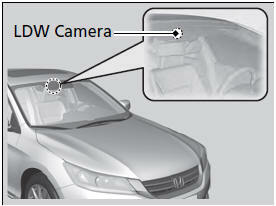 Never apply a film or attach any objects to the windshield that could obstruct the LDW camera's field of vision. Scratches, nicks, and other damage to the windshield within the LDW camera's field of vision can cause the system to operate abnormally. If this occurs, we recommend that you replace the windshield with a genuine Honda replacement windshield. Making even minor repairs within the camera's field of vision or installing an aftermarket replacement windshield may also cause the system to operate abnormally. After replacing the windshield, have a dealer recalibrate the camera. 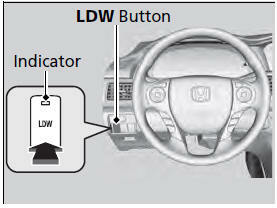 Proper calibration of the LDW camera is necessary for the system to operate properly. To help reduce the likelihood that high interior temperatures will cause the camera system to shut off, when parking, find a shady area or face the front of the vehicle away from the sun. Also, do not use a reflective sun shade that can concentrate heat on the camera. • Use the climate control system to cool down the interior and, if necessary, the defroster mode when windows are fogged. • Start driving the vehicle to lower the windshield temperature, which cools down the area around the LDW system. Press the LDW button to turn the system on and off. - The indicator in the button comes on when the system is on. 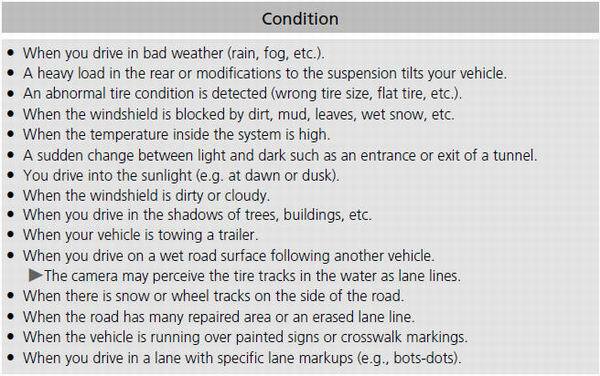 LDW may not activate or may not recognize lanes, and may activate even when keeping in the middle of a lane under the following conditions.